MANILA, Philippines - American Touristar Ryan Gallagher has once again captivated the hearts of Filipinos as he sang Gary Valenciano's "Hanggang Sa Dulo Ng Walang Hanggan" during the Gate 3 round of ABS-CBN's music competition "I Love OPM" on Saturday, April 2, 2016. The 27-year old artist was able to impress the judges called "Himig-gration Officers" and the "100 Kababayans" on his heartfelt rendition. Ryan received 95 Love Hearts from the latter and was the "Judges Choice" as key to enter Gate 4 round. Judges Martin Nievera and Lani Misalucha picked Ryan to move to the Gate 4 of the competition. In the Gate 3 round, the top 12 artists were divided into groups of 3. Gallagher was grouped with Yohan Hwang and Daniel Herrington. 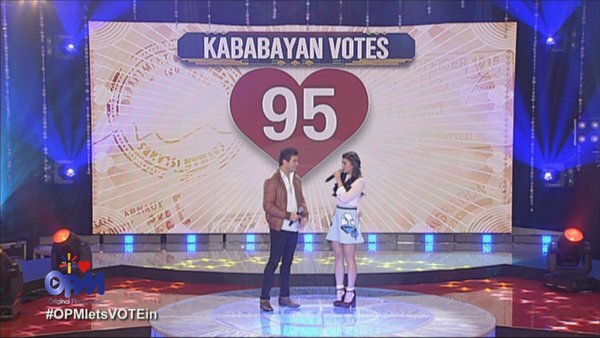 The studio audience served as the fourth 'Himig-gration Officer' as they will give Love Hearts or Broken Hearts. At the end of the round, only two Touristars will move on to the next phase of the competition. "Intensity is like the 'big one,' said one of the Kababayan to Gallagher. What did you think of Ryan's performance? Express your thoughts in the comment section below.